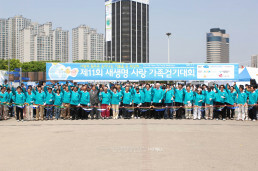 On a genial day in spring, the Seoul Olympic Park was filled with joyful laughter of the families who came out to participate in the walkathon. This day, they realized the value of family and worth of helping neighbors in need. The Intl. We Love U Foundation held the 11th New Life Family Walkathon. 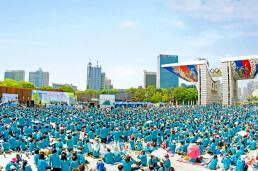 Around 10 a.m. on May 3, over 12,000 members gathered at the Peace Square in the Seoul Olympic Park to take part in the walkathon. IWF Chairwoman Zahng Gil-jah, Chief Director Lee Gang-min and board members, PR ambassadors, Sponsor Chairman Lee Sun-jae and Executive Advisor Lee Bae-geun attended the walkathon, which was sponsored by Ministry for Health, Welfare and Family Affairs, Seoul Metropolitan City, and Sejong General Hospital. Ambassadors to Korea from six countries in Asia and Africa, and embassy officials were also present. 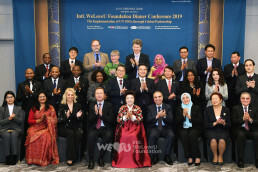 After that, the heads of legations stood on the platform and delivered the messages of thanks and love to the IWF members, who donated the water pumps for the health improvement and life of the people of their countries. In the Pump Donation Ceremony, the donations for water pumps were given to the embassies of six countries in Asia and Africa. 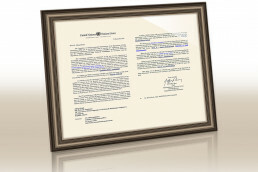 Development of underground water and installation of water pumps will be progressed through the on-site inspection. Watching the guests’ demonstration of operating a water pump, all members gave a big round of applause, wishing the water of life to be delivered quickly to the country in Asia and Africa. Around noon, the walkathon started with the departure announcement of Chairwoman Zahng Gil-jah. When the members in blue shirts walked the 1.8 km course in the Olympic Park, it looked like the living water flowing towards the world. 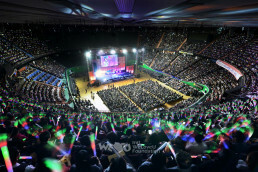 The blue wave shaped by 12,000 participants was a touching spectacle. Children walking joyfully, holding the hands of their mothers, children riding pickaback on their fathers and watching the higher world, little children walking with their grandfathers . . . The children smiled happily, walking with their families, and their hearts were full at the thought of helping their neighbors. At the Peace Square, in order to inform the reality of the countries suffering from water shortage, many sections—water PR booth, message of hope, photos gallery about living water, and experience of pumping water—were prepared and provided a good chance to educate the families who finished walking. 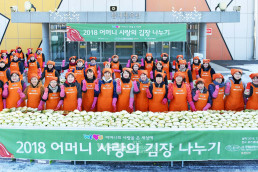 In addition, the volunteers from Daejayon [Intl. University Student Environmental Protection Volunteer Association] operated the “Green PR Booth,” and “Energy Saving Booth,” and gave education and delight to the participants through various events: Face Painting, Traditional Korean Games, Family Olympics, Smile Family, Photo Line and so on. The healthy and happy smiles of the children delivered another joy to children in Asia and Africa. In a photo, African children were rejoicing after receiving water pumps through the last walkathon. The IWF members participate in various events with their families: family Olympics, traditional games and so on. Children are carefully listening to the explanation of the volunteers, seeing pictures.